The author who discovered that Amazon warehouse staff were peeing in bottles to avoid taking too many breaks said the working culture was like a prison. James Bloodworth went undercover in 2016 to work at an Amazon warehouse in the UK, for a book on low-paid jobs in Britain. He described to Business Insider how he had been collecting items as a "picker" and came across a bottle of urine on the shelf. Bloodworth said people didn't have enough time for a proper lunch break, and were penalized for sick days. Amazon didn't recognize the picture painted by Bloodworth. It said workers could use the toilet whenever they needed, and that they were not monitored. Working in an Amazon warehouse is like prison, according to an author who went undercover at a fulfillment center and found staff were peeing in bottles because they had no time to go to the toilet. James Bloodworth investigated casual work and its impact on people's lives for his book "Hired: Six Months in Low-Wage Britain." For research, he took low-paid jobs at an Amazon warehouse, in social care, a call center, a building site, and as an Uber driver to explore how people coped. Bloodworth spent just under a month in 2016 working as a "picker" at an Amazon fulfillment center in Rugeley, in central England. This involved running around the center picking up items that people have ordered for delivery. Bloodworth said he was employed through Transline, an employment agency which Amazon no longer uses after it sent 1,500 people to work in poor conditions at the warehouse of major British retailer Sports Direct. Amazon staff had to meet productivity targets which, according to Bloodworth, were only feasible if you ran around the warehouse — something Amazon didn't allow for health and safety reasons. He told Business Insider: "The job itself is really bad. I've worked in warehouses before but this was nothing like I had experienced. You don't have proper breaks — by the time you get to the canteen, you only have 15 or 20 minutes for lunch, in a 10-and-a-half hour working day. You don't have time to eat properly to get a drink. "You have to go through security when you leave the warehouse, and that adds five minutes. It's like an airport — belt off, watch off. The atmosphere is what I imagine a prison feels like. You felt like you were walking on eggshells." Bloodworth's claims that Amazon workers were so rushed that they had to pee in bottles caused outrage on social media sites such as Twitter and Reddit on Monday. To recap, Bloodworth told The Sun that the productivity targets were so high that warehouse workers were scared to take a break and go to the toilet, in case of punishment. They peed in bottles instead, he said. In his follow-up conversation with Business Insider, Bloodworth said he didn't resort to the pee bottle system partly because he knew he could leave the job at any time. "I'd just take the bollocking for idle time," he said. "If you're on the top floor, you know it will take five minutes to go the toilet, and all the time you're being admonished for taking too much idle time." He also said he had discovered the problem when he came across a bottle of urine while looking for items on an upper floor of the warehouse. "One day I'm walking down the aisle and I go to pick up an item. And there's a bottle of straw-colored water on the shelf and at first, I thought 'Oh, what's that?'" he said. "And then it was very obvious what it was. And there was a pool of water next to it. It struck me — it was so obvious why someone would do that." Amazon said it doesn't time warehouse workers' toilet breaks and that it ensures people can reach the bathrooms easily. Bloodworth also outlined Amazon's penalty points system. Racking up six points for issues like unexplained absences could lead to a disciplinary process and dismissal, he said. An investigation by The Times at the end of 2016 similarly found that workers were penalized for taking sick days. Legitimate sick days theoretically should not be penalized, but Bloodworth said he received a point after telling his manager that he needed a sick day. That's despite giving more than the required one hour's notice, and being able to provide a sick note. "It's the sheer oppressiveness of management regime there," he said. "It's the most oppressive place I had ever worked, easily." In a lengthy statement to Business Insider, Amazon said it didn't recognize Bloodworth's allegations as representative of the working environment at its warehouses. The company also said it no longer has a "points-based attendance policy," and that it coaches people who aren't hitting their productivity targets fast enough. Amazon provides a safe and positive workplace for thousands of people across the UK with competitive pay and benefits from day one. We are committed to treating every one of our associates with dignity and respect. We don’t recognize these allegations as an accurate portrayal of activities in our buildings. We have a focus on ensuring we provide a great environment for all our employees and last month Amazon was named by LinkedIn as the 7th most sought-after place to work in the UK and ranked first place in the US. Amazon also offers public tours of its fulfillment centers so customers can see first-hand what happens after they click 'buy' on Amazon. Amazon has a range of initiatives to support our people if they become ill at home or at work and we recently extended these to include improved on-site support. We recognize that there are times someone cannot come to work, even if they want to. If someone is ill, we want to help them get back to work when they are fit to do so. We no longer have a points-based attendance policy – we changed it following feedback from out our associates. If someone is sick, we will have a conversation with them to understand their own individual circumstances. We completely support our people, and use proper discretion when applying our absence policy. As with nearly all companies, we expect a certain level of performance from our associates and we continue to set productivity targets objectively, based on previous performance levels achieved by our workforce. Associate performance is measured and evaluated over a long period of time as we know that a variety of things could impact the ability to meet expectations in any given day or hour. We support people who are not performing to the levels expected with dedicated coaching to help them improve. Amazon ensures all of its associates have easy access to toilet facilities which are just a short walk from where they are working. Associates are allowed to use the toilet whenever needed. We do not monitor toilet break. 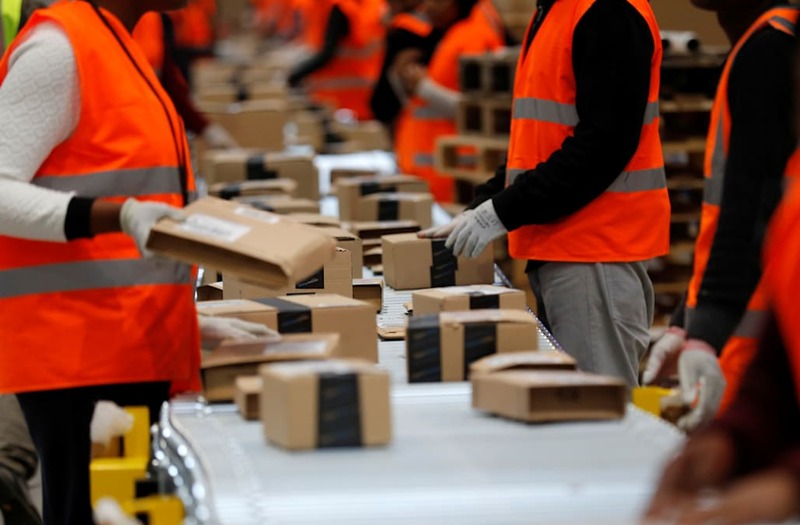 The pay rate for permanent Amazon’s fulfillment center employees in the UK increases over their first two years of employment, after which time all employees earn £8.35 an hour and above. All permanent Amazon fulfillment center employees are given stock grants, which over the last five years were on average equal to £1,000 or more per year per person. Employees are offered a comprehensive benefits package, including private medical insurance, life assurance, income protection, subsidized meals and an employee discount, which combined are worth more than £700 annually, as well as a company pension plan. Amazon also offers employees an innovative programme called Career Choice that provides funding for adult education, offering to pre-pay 95% of tuition and associated fees for nationally recognized courses, up to £8,000 over four years.